Think America and there are a few things that come to mind  big juicy burgers, stars and stripes, Led Zeppelin, hot dogs and massive gas guzzling trucks. And that last part of America is what has made its way into India in the form of the Ford Endeavour. The Endeavour is everything a SUV has to be. It is big on size and attitude, menacing to look at and built on a solid ladder frame chassis. Big old school indeed. In terms of styling ,the Endeavour and XUV are as different as Lady Gaga and Mother Teresa. One employs a mindnumbing number of flowing lines and has spent long periods of time on the drawing board while the other seems to have been designed using just a pencil and a ruler. In a sense both cars are supposed to cater to different audiences  young and not so young. In terms of road presence, the Endeavour wins, no questions asked. The sheer size of the car is enough to make grown men go weak in the knees. But what the XUV does better than the Endeavour is turning heads. With its (some say) radical design and bright colour (ours was Tuscan Red) the XUV does not leave a single eye uncaught. Both, then, have their own pros and cons. Under the Endeavour's hood lies a noisy 2.5-litre diesel power plant that makes 143PS of power and 330Nm of torque. And when I say noisy, I don't mean just outside. The engine transmits almost as much noise inside as it does outside. So in terms of refinement, the Endeavour loses out to its newer born rival. But then again, some might say that in this crude nature of the Endeavour lies its charm. Well, everybody's entitled to their opinions, aren't they? As far as performance numbers go, the XUV beats the Endeavour by 2.5seconds with the Ford taking in 15.3seconds to 100kmph dash while the Endeavour runs out of breath at 145kmph (to the XUV's 183kmph). 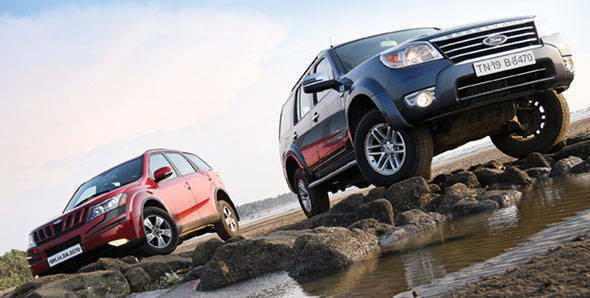 The XUV also outshines the Endeavour in braking performance, with it coming to a halt from 100kmph in 49.37m which is 7m less than the Endeavour's 56.37m. Both get ABS, the XUV also adds ESP. The surprising thing about the Ford is that inside the Endeavour does not seem as big as it seems from the outside. Quite possibly because of the relatively small steering wheel and the not so tall seating position. The interiors are a very plain affair with only a 6 CD changer and quite literally nothing else. This SUV is not that hard to wheel around in traffic if you are okay with doing three-point turns at every intersection. The ride quality is very soft and soggy and that means massive body roll, ponderous steering and poor handling  it is not something you will drive even moderately fast. Take both off road and the front-wheel-drive XUV does not get left behind the rear-wheel-drive Endeavour; in fact the latter's size will prove to be a bit of a bother on narrow trails. One of the main grouses against the XUV is the lack of storage space. With the third row up, there is absolutely no space to store anything more than a paper folder in the boot. The Endeavour on the other hand has actual usable space even with the third row up. And since at 5060mm, the Endeavour is 475mm longer than the XUV, once the third row is folded away (or removed all together) , there is enough space to store more stuff than the XUV can ever dream of. It would be easy to dismiss this comparison just by citing the price, and that would see the Endeavor fall to the side with just the XUV soldiering on. But the XUV is much more than a cheaper alternative to the Endeavour, it is both mechanically and emotionally the Endeavour's better. The all American (actually more south east Asian) SUV is simply outdated and outclassed in nearly all respects.